Sweet and Sour is a classic flavour profile that your residents will know and love. 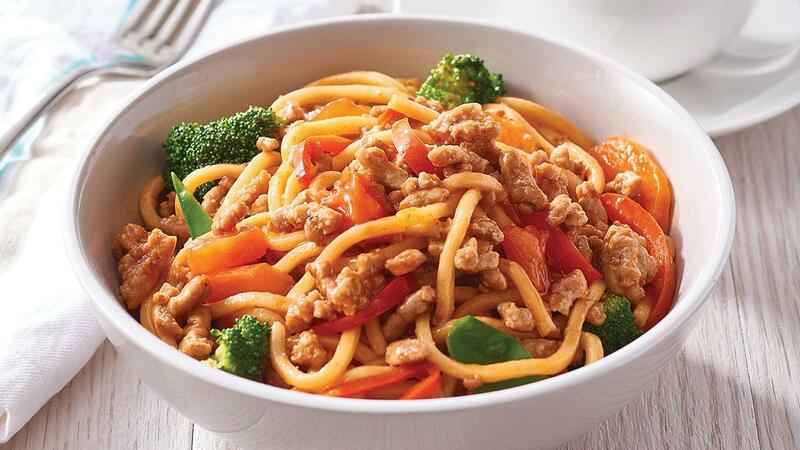 Adding KNORR Japanese Teriyaki Sauce GF gives this recipe a new twist. Heat half the oil in a large wok over high heat. Add pork mince and cook until well-browned. Remove from heat. Heat remaining oil in the wok then add broccoli, carrot and capsicum and stir fry until just tender. Meanwhile prepare noodles according to packaging instructions. Drain. Return mince to the wok, along with noodles, snow peas, KNORR Chinese Sweet & Sour Sauce GF and KNORR Japanese Teriyaki Sauce GF. Stir fry until sauce is reduced. Serve the stir fry, scattered with sliced green onions.